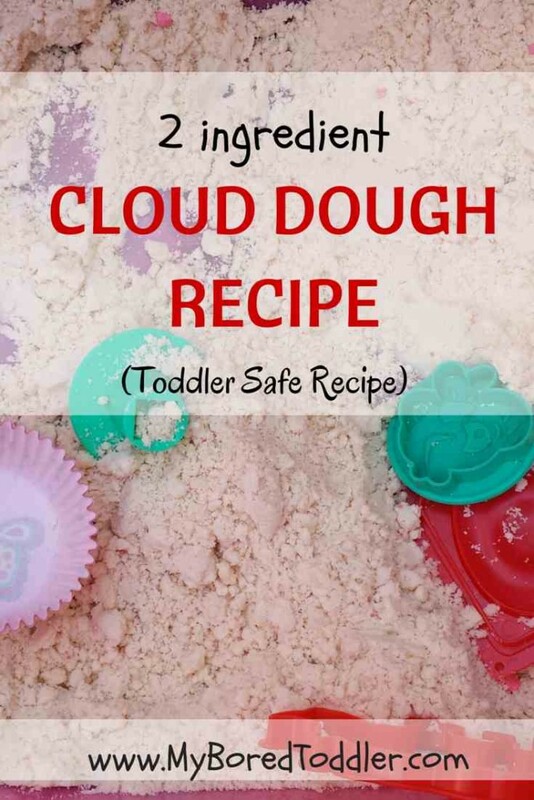 This cloud dough recipe for toddlers is so easy that you will wonder why you have never made it before. If you don’t know what cloud dough is, it resembles a sandy texture but without the annoying sand! Made from oil and flour it is also soooo cheap to make I’d estimate that we used about 40c worth of ingredients today. Not bad for an hours worth of fun, and we can store it away for another day. 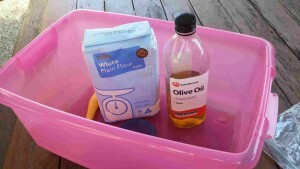 You’ll notice that we use cooking oil for our recipe, even though many people use baby oil. The only reason for this is to make it toddler safe. If your toddler puts this in their mouth (let’s face it – it WILL happen), it won’t taste great but it’s perfectly safe. As if to prove my point, my one year old tried to eat handfuls of the stuff. You would think she hadn’t eaten all day! (halve the recipe if you don’t want too much, but I found that this was a good amount. I had 2 children playing with this much). Mix together. Start with a spoon, but you will end up mixing it with your fingers. 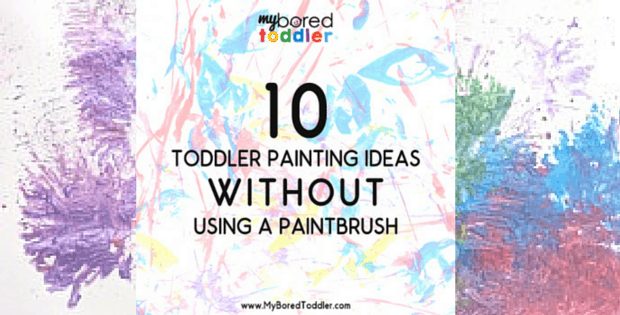 I let my toddlers do all of this and they had lots of fun making it. Cloud dough has an almost sand like consistency, so there’s no limit to how you can use it. I put all of our play dough toys in for one activity, made ‘sandcastles’ another day, and had a pretend baking day on another. Store the cloud dough in a sealed container and it will last for ages. 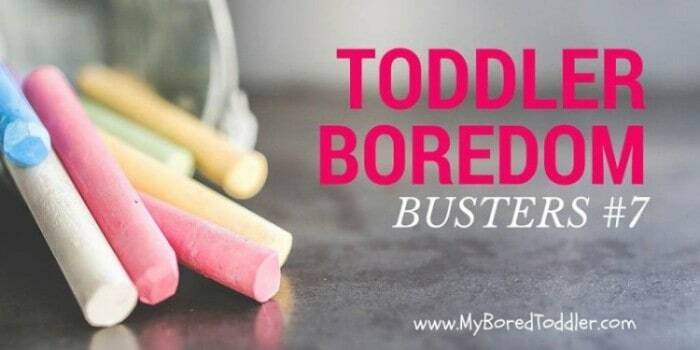 .If you want to keep your toddler busy makes sure you subscribe to our weekly newsletter and follow us on Facebook, Twitter, Instagram and Pinterest. This is a really great idea! My daughter will love this. Oh, my toddler is gonna love this! It’s a lot of fun – and one of the less messy of the messy play activities! We’ve still got cloud dough we made nearly 2 years ago! T used to love it, I might get it out again now I’ve been reminded. We made ours with aloe baby oil so it smells divine too. We love cloud dough! The best thing is that toddlers can safely play with it. 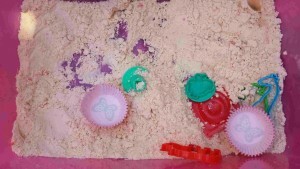 Cloud dough is one of my daughter’s favorite sensory plays! Thanks for sharing at our FB Share Day! Pinning. It was so cheap – definitely less than $1 to make heaps. The baby oil definitely smells better! Cloud dough is great, we made some last year, but I never got around to writing about it. We must do it again. We love to make and play with cloud dough! So easy to make and it keeps the kids busy for ages. Thanks for linking it up on the Family Frugal Linky. Home made dough is the best! Your post has been featured on this week’s Frugal Family Linky via Peakle Pie! Hope to see you joining in again soon and remember to pop by and grab your ‘I’ve been Featured’ badge too! Oooh Thankyou! So excited to be featured! Who doesn’t love cloud dough?? Too many of the recipes have that one ingredient I don’t have in the house, or costs too much to use on play. Thanks for sharing! Hello from Frugal Family Linky. Thanks Melissa – glad you liked the recipe! Wow! That seems so simple (and cheap!!). I am so excited to make this for my daughter! We love all things molding and scooping. I’ve tried something similar but it wasn’t the same. Definitely going to try this! I didn’t see in your post, if you said or not, is it possible to color it? Maybe add it to the oil? I am always a bit amazed by this! My grandbabies would love it! Thanks for sharing with us at Throwback Thursday! We love cloud dough – such an amazing texture.